The Hillside Course is one of three nine-hole courses at Peninsula Lakes Golf Club. It is similar to the original course at the club, the Quarry, in that water comes into play on four holes. This golf course, however, uses the many lakes scattered throughout its landscape in creative ways to provide a unique set of challenges. The Orchard Course is one of three challenging nines at Peninsula Lakes Golf Club. The course's layout features tricky elevation changes and there are also sand traps and bunkers bordering the greens and fairways. Like the other two courses, the Orchard features several lakes but it is flatter, straighter, and more narrow than the other nines. Peninsula Lakes Golf Club is home to 27 holes of golf. The Quarry Course, the club's original course, is named for its layout, which descends to the bottom of a quarry and then makes a gradual ascent to the clubhouse. There are four large lakes throughout this nine-hole course that comes into play on four holes. 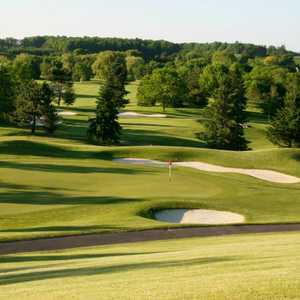 The 18-hole Sawmill Golf Course in Fenwick, ON is a semi-private golf course. 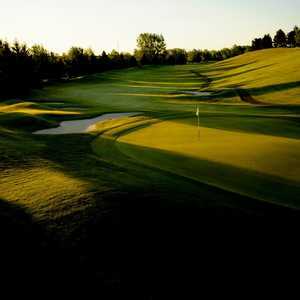 Designed by Gordon Witteveen, Sawmill Golf Course measures 6590 yards from the longest tees and has a slope rating of 127 and a 71.4 USGA rating. The course features 4 sets of tees for different skill levels.